Saba is a Dutch island south of St. Maarten in the Lesser Antilles. 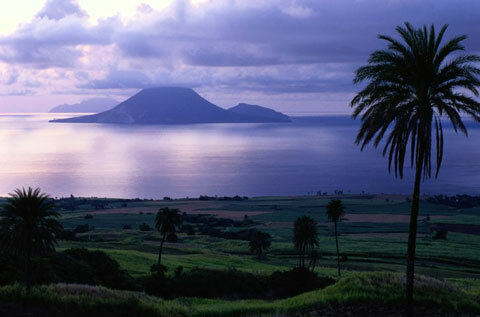 This tiny mountainous island boasts a highest point of 2,877 feet above sea level atop Mount Scenery, a volcano that last erupted circa 1636. The steep volcano continues under the water, where divers can enjoy the Saba National Marine Park. Visitors come to the island mainly for scuba diving. There are no beaches on Saba, so those in search of sand and surf may wish to visit a different island. Several villages with traditionally red-painted roofs dot the windy road that splits the island, connecting a little port and a small airstrip. Saba also hosts a small medical school, SABA University, where about two hundred students come to study. The hotels on Saba are small and inexpensive but have gorgeous views of the Caribbean Sea and the surrounding islands. Restaurants offer local Caribbean fare as well as fresh seafood.